My sweet niece A. was sweet fourteen. I thought she might like to have a little basket To Put Things In. I made sure I was up to date on the décor of her room – a good thing, because it turned out there’d been recent changes in the color scheme: Purple and green now set the tone. 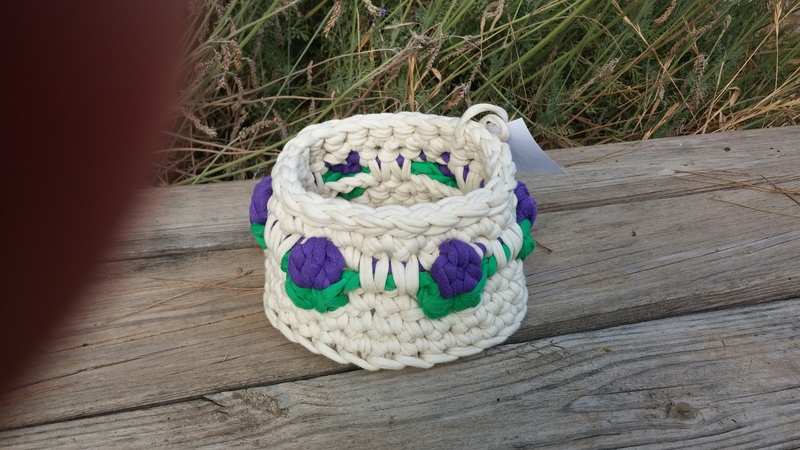 I wanted the basket to be floral and… Sweet! At the time I was just starting out with fabric crochet and I remember thinking, How…??? The image, and the question, lingered in my mind. I think (hope?) A. liked it. 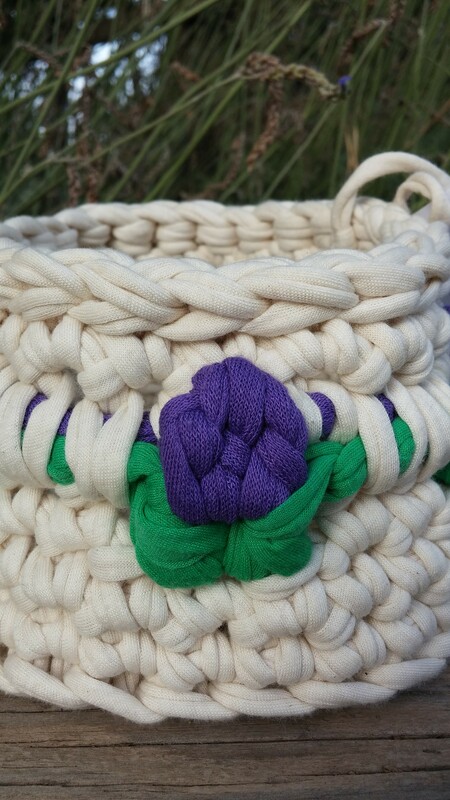 I took a minute during A.’s party to take some pictures of the basket. Isn’t the spot just perfect? 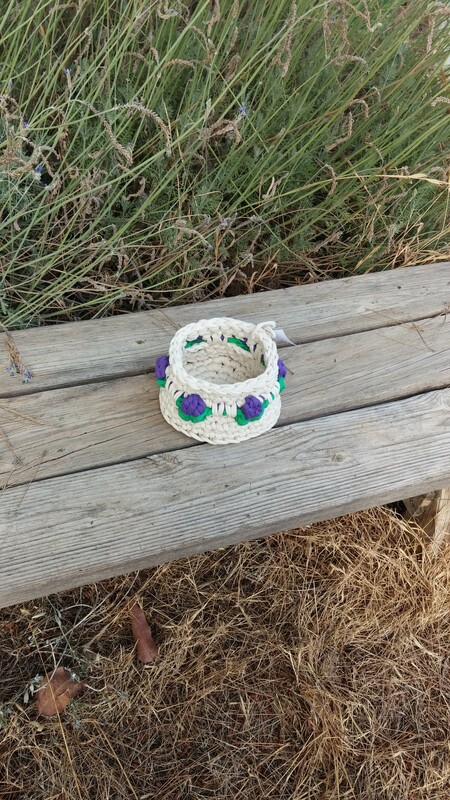 This entry was posted in Projects and tagged big hook crochet, crochet basket, crochet flowers, fabric yarn, t-shirt yarn, tarn, textile yarn, trapillo, Zpagetti, סלסלה מטריקו, סריגה בטריקו on July 21, 2016 by The Basket Fairy. 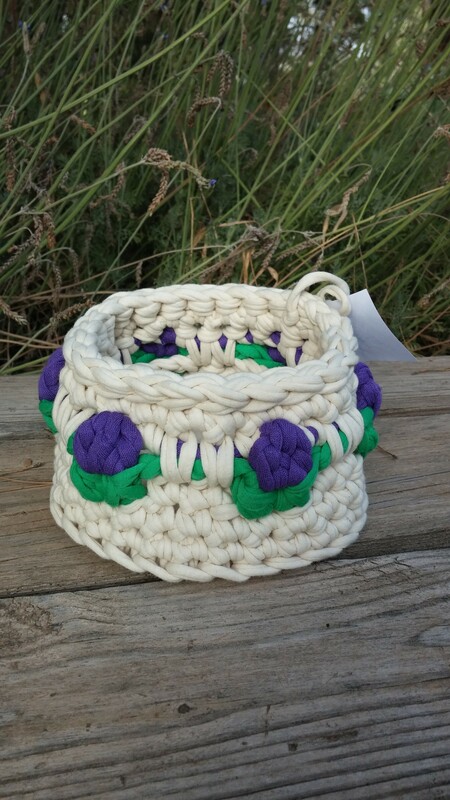 What an adorable little basket! I love it. And I really liked your fairy garden too! You’re welcome. I’ve always loved baskets…and miniatures. This just makes me smile.